I hope you’re all pleased with yourselves! You guys hit me with a MWBB record number of entries (16!) on the one week I ran into a Judging snafu… Well played, my friends. Well played. This is usually where I say I’m going to shut up and let the Judge take over but that doesn’t really fly since I’m the Judge. So…. here’s what I’ve come up with. Atmospheric story with great pacing & well-crafted action sequences. The revelation of the supernatural angle is very, very effective. Thanks to all of our writers & readers….. 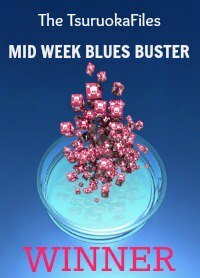 This was a fantastic week at the Blues-Buster and I expect to see you all back next week….